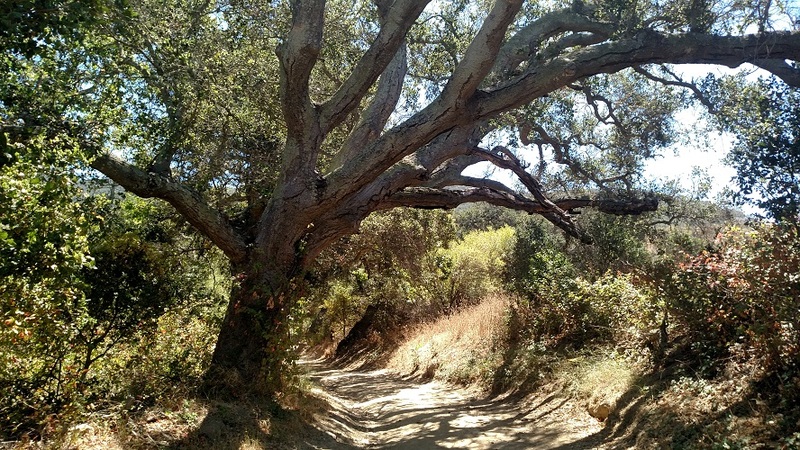 Location: Gaviota State Park, Santa Barbara County. From Highway 101 (32 miles west of Santa Barbara and 8 miles south of Buellton) take exit 132 for Highway 1/Lompoc. Head east (turn left if you are coming from the north; right if you are coming from the south) and make a quick right onto Gaviota Park Boundary Road. Follow it a short distance to its end at a parking lot. The day use fee is $2 per vehicle (checks or cash; no change given). 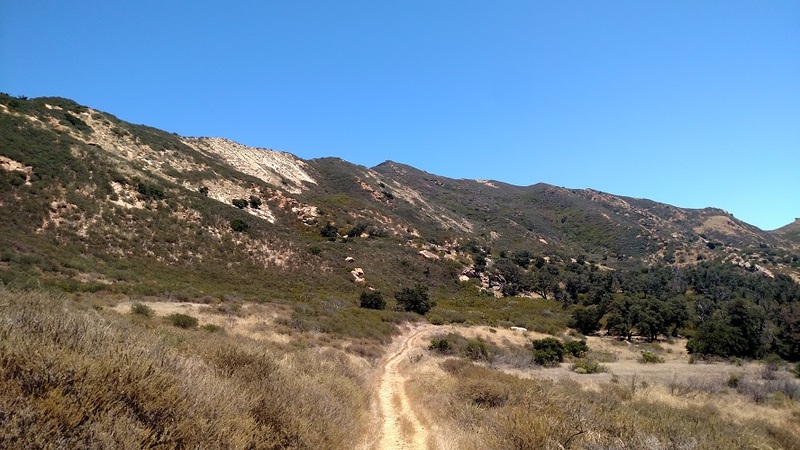 Camping/backpacking: Gaviota State Park has a beach side campground a few miles south of this trail. Click here for more information. 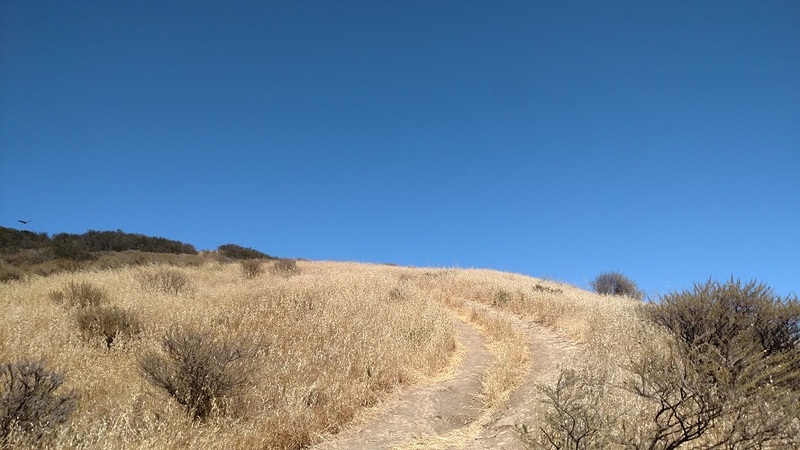 Panoramic coastal views, rock formations and a chance to visit some secluded hot springs make Gaviota Peak a popular destination for Santa Barbara and San Luis Obispo hikers. 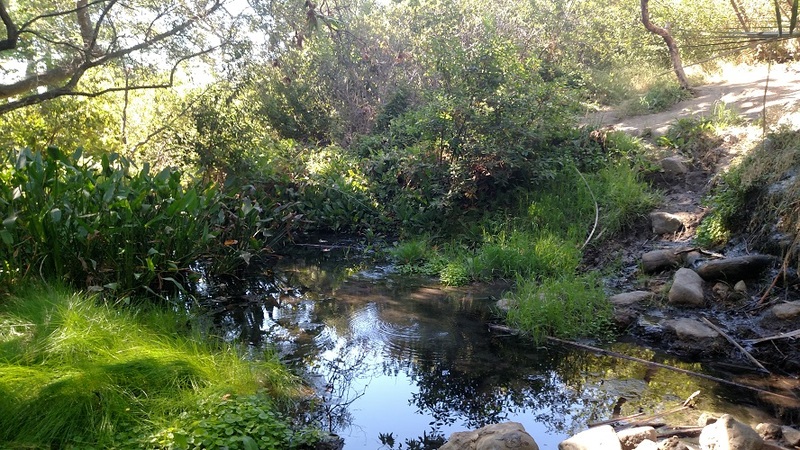 Even L.A. residents will find this peak to be a worthwhile destination for a day hike, or perhaps as part of a camping trip at the nearby state beach. Don’t underestimate the challenges, though – steep terrain with little shade. From the parking lot, follow the fire road a short distance to a junction with the Trespass Trail. Make a hard right and walk to another junction, where you will stay left (the Tunnel View Trail is the right fork). 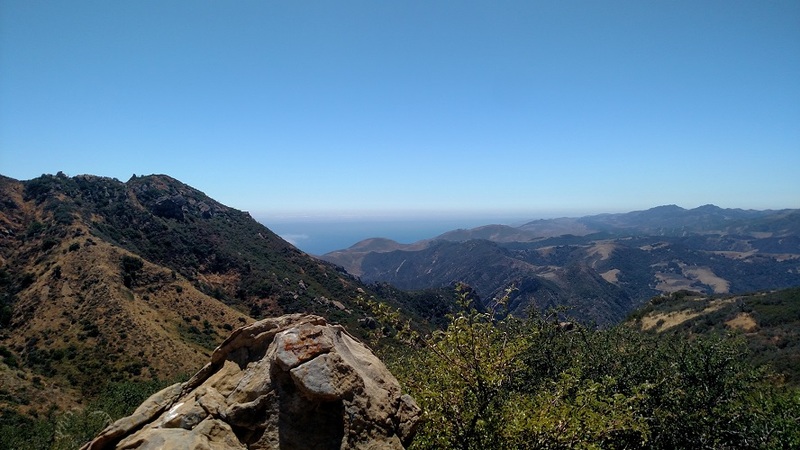 The Trespass Trail climbs the west slope of Gaviota Peak, providing views of Gaviota Pass to the south. At 1.2 miles from the start, you reach another junction with the Tunnel View Trail. Head left and continue along the Trespass Trail, now heading due east. You’ll pass through a gate onto private land that gives the Trespass Trail its name (since this trail is an easement, you aren’t actually trespassing, but the name has stuck nevertheless.) At a Y-junction, bear right and head briefly downhill before beginning a climb to a saddle, 2.4 miles from the start. At this point, you have gained about half of the elevation required for the hike, but the rest is all crammed into the next mile. 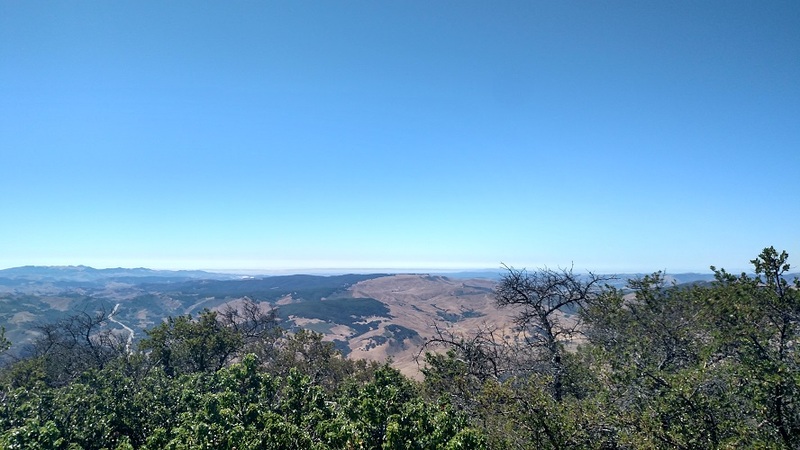 At the saddle, you have your choice of ascending a steep fire break on your left or heading straight for a short distance on the official trail and then using an unmarked single-track – also steep – to reach the same spot. About 200 feet above the saddle, you reach a good rest spot with a large rock overlooking the canyon below. After catching your breath, the grind continues, leveling out slightly below the summit. 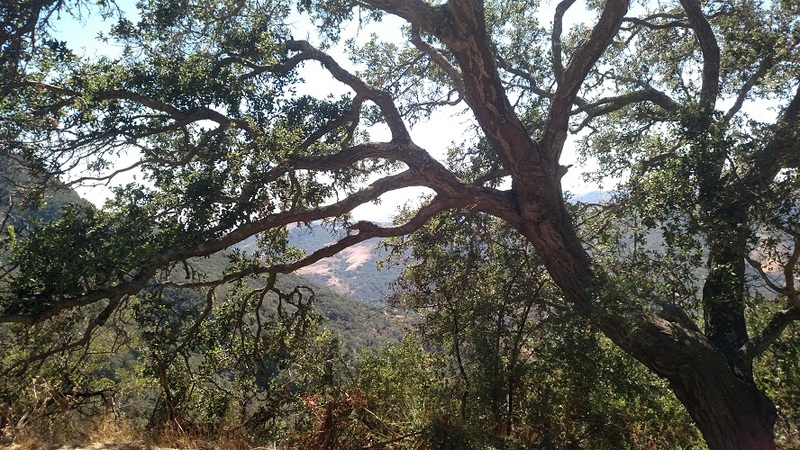 Here your efforts are rewarded with a 360-degree panorama including the Santa Ynez Mountains to the east, the ocean to the south and Lompoc Valley to the north and west. On clear days, the Channel Islands are visible. 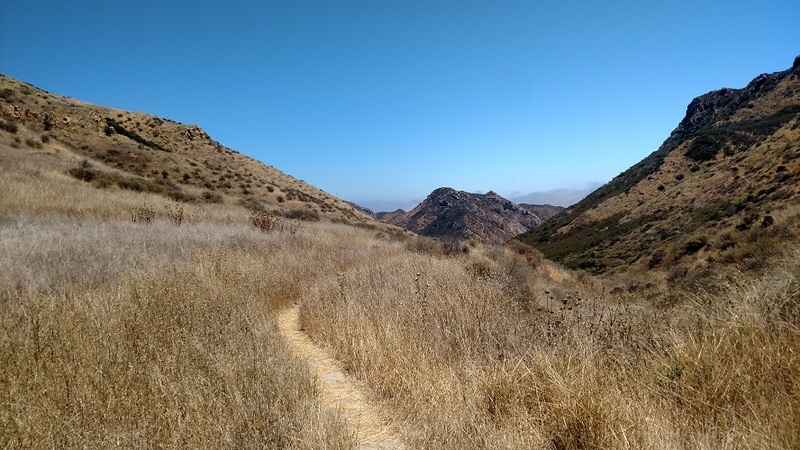 After enjoying the views, follow the same trail off the summit, heading northeast to meet the Gaviota Peak Fire Road. Turn left and begin your descent, taking in more views to the north and west. About two miles below the summit, look for an unmarked but clear use trail leading to the hot springs. Though the pools are shallow (knee high for most adults) it is still possible to have a nice little soak in them before heading back to the trail head. The muddy ground on the bottom of pool is quite soft, so don’t be surprised if you sink another few inches when you enter the water. After visiting the springs, follow the use trail downhill alongside the creek, soon returning to the fire road. Bear left and follow the fire road downhill to the junction with the Trespass Trail and then back to the parking lot.